One of the many pretty villages we visited on Saturday afternoon [21 July 2018] as part of our journey through the Burren was Ballyvaughan, the most northerly place in Co Clare and close to the border with Co Galway. 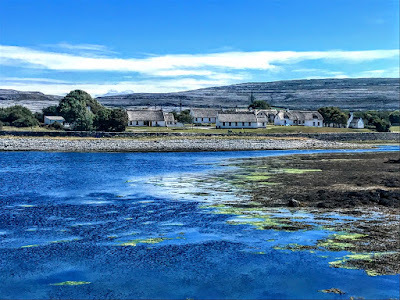 This traditional and beautiful fishing village stands at the entrance to the Burren and looks over Galway Bay to the coast of south Connemara. It is set in wooded a vale and was once a small fishing and trading port. 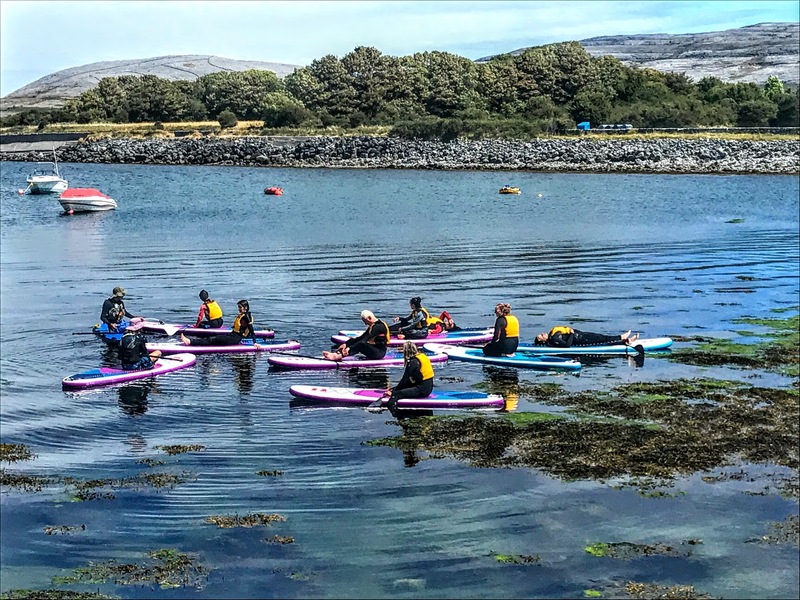 It is now an ideal base for exploring the Burren, and the Corkscrew Hill outside the village gave us spectacular views of the sea and the barren mountain landscapes. Ballyvaughan owes it origins to Ballyvaughan Castle, which once stood at the edge of the harbour, on the promontory where the Irish Cottage scheme is located today. For centuries, the castle belonged to the O’Loghlen family, apart from a brief period in the 16th century when it was held by the O’Brien family. A stolen cow was found at the castle in the 1540s, and heavy fines were levied on the O’Loghlens, including the loss of cattle, goats and sheep and of the town of Ballyvaughan. The Lord Deputy, Sir Henry Sidney (1529-1586) – brother of Lady Frances Sidney Sussex, founder of Sidney Sussex College, Cambridge – attacked the castle in 1569, but the O’Loghlens managed to hold on to the property. The present village grew up around the harbour in the 19th century, when this was a thriving port for just a short time. Three older piers had been built by the villagers, who used them for herring fishing. But these piers were unusable at high tide, and the Fishery Board built a new quay in 1829. The new quay was designed by the Scottish engineer Alexander Nimmo (1783-1832), who had been working in Ireland from 1811. He designed a new harbour at Dunmore, Co Waterford, in 1814, and improved the navigation on the River Lee in Cork and improved the harbour at Cobh in 1815. From 1820, Nimmo worked on making extensive surveys and recommendations for Ireland’s fishing harbours. The Knight of Kerry commissioned Nimmo in 1830 to design a new village on Valentia Island, Co Kerry, that was later named Knightstown. He also designed the road from Galway to Clifden and the harbour of Roundstone in Connemara. Nimmo redesigned over 30 harbours on the west coast of Ireland in the 1830s. One of his major projects was the Wellesley Bridge in Limerick, built in 1824-1835 and now known as Sarsfield Bridge. Nimmo died at his home at 78 Marlborough Street, Dublin, in 1832. By 1831, turf from Connemara was landed at the quay in great quantities, despite the shallow depths in the bay. To facilitate the turf trade, another quay was built in 1837, apparently also based to a design by Nimmo, who had died five years earlier. The new quay was of great importance, as it allowed Ballyvaughan to export grain, bacon and vegetables and to import supplies from Galway, and also allowed Ballyvaughan to benefit from the herring fishing boom. 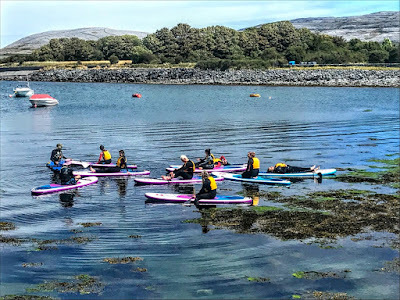 Exports from the Burren valleys included grain, lamb, pork, bacon and vegetables, while turf boats from Connemara crossed Galway Bay bringing much-needed peat because the Burren was without trees and lacked fuel. Meanwhile, Ballyvaughan Castle was in ruins by 1840, and only the foundations remain today. The local landlord, Richard Plantagenet Temple-Nugent-Brydges-Chandos-Grenville (1797-1861), 2nd Duke of Buckingham and Chandos, was declared bankrupt in 1847 with debts of over £1 million, and he was forced to sell vast tracts of land in the Burren in 1848. The Buckingham estates in the Barony of Burren, Co Clare, extended to 2,800 ha (7,000 acres). They were bought for £30,000 by Richard Samuel Guinness, acting as agent for Henry White (1791-1873), MP for Longford, whose father had made his fortune as a lottery operator in Dublin. White became a peer in 1863 when he was given the title of Baron Annaly, of Annaly and Rathcline in the Co Longford. As a benevolent landlord, Lord Annaly built a reservoir outside Ballyvaughan in 1872 to supply water to the farms in the valley. This water supply was extended to the town in 1874, and in 1875 a fountain was built by the Coyne brothers from Connemara when they were stranded in town after their ship sank at Gleninagh pier. For a while, Ballyvaughan was the official capital of this region of Clare, with its own workhouse, coastguard station and a large police barracks. But over time, as the roads improved and the piers fell into disrepair, the town lost its importance as a fishing harbour. 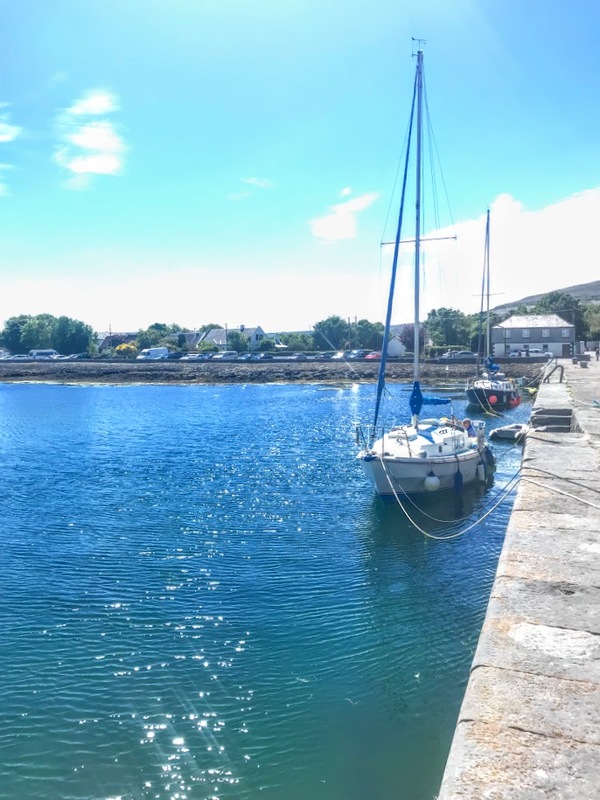 During the recent economic boom in Ireland, Ballyvaughan became known as Ireland’s ‘Gold Coast’ because of a boom in property prices in the area. Today, the economy of Ballyvaughan is based mainly on tourism. The new pier and slipway, built in 2006, have opened up the area to boating, fishing, scuba diving and other maritime activities. Today the village bustles with visitors rather than fishermen as a base for exploring the Burren’s landscapes, unique flora and its archaeological and Christian heritage. Looking at the yachts and surfboarders on the blue waters beneath blue skies in the harbour at Ballyvaughan at the weekend, I wondered whether I could be closer to a summer scene in Greece.